The incense culture of Japan has quite an old tradition. Incense was used not only in temples, but at the imperial court.
. Incense - general introduction . and the text below, about koogoo incense containers. CLICK for many more samples ! A small lidded container for the incense that is added to the charcoal fire during the charcoal-laying procedure. For the kneaded incense (nerikō) that is used in a sunken hearth (ro), the container is generally made of ceramic. For the chips of incense wood (kōboku) used in a portable brazier (furo), it is generally made of lacquer ware or plain wood. 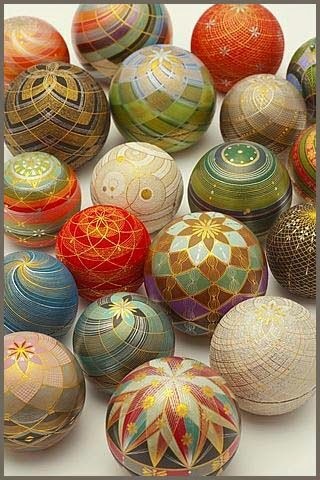 There are also incense containers made of clam shells. Incense in Japan has been introduced together with Buddhism in the 5th century and been used during religious ceremonies for a long time. Five to seven different kinds of incense ingredients are finely chipped and mixed together. The mixture is kept in a container called "koogoo" (kogo, kohgoh, kougou) and is sprinkled directly on hot ash containing charcoal. This ritual offernig of incense to the Buddha (sonae-koo 供え香、shookoo 焼香) is usually performed during a funeral ceremony. Stick incense was introduced in the sixteenth century via China and Korea and soon became very popular because it was easier to use. Joss sticks were soon also used for pure pleasure in the home.The burning of fragrant chips for pleasure only was also called "empty burning" (soradaki 空薫). The container is also called "Incence box" (koobako 香箱). The natural scent of plum blossoms was also greatly appreciated and subject to Heian poetry. Another form of incense consists of pulverized chips of up to 20 different kinds, mixed with honey to keep it fresh and rolled to little balls (nerikoo, neriko 練香) which had to rest for three years to gain the right scent. These "fragrant substances" (kunkoo 薫香) were also thrown directly into the fire during a religious fire ceremony (goma kuyoo 護摩供養). 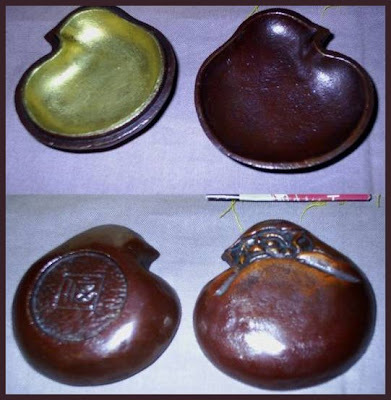 Containers for incense used in temples during the Heian period where round bowls on a high stand with a lid in the form of an upside down bowl with a handle in the form of a Pagoda (toomari 塔椀). Since the Kamakura period round flat containers came into use. Many materials were used for these containers, for example metal, porcelain, ivory, laquer or wood. The Zen sect often uses containers made of carved wood with a thick layer of red or black laquer (chooshitsu 彫漆). You can also look at beautiful laquered incense containers from various museums. Learn more about the Way of Incence and its history. CLICK for more Daruma containers !
. . . CLICK here for Photos of English HP ! Another smell I associate with Daruma san is that of fresh green tea. After all he is the father of the Tea Plant in ancient lore. I am still working on more details of this story. 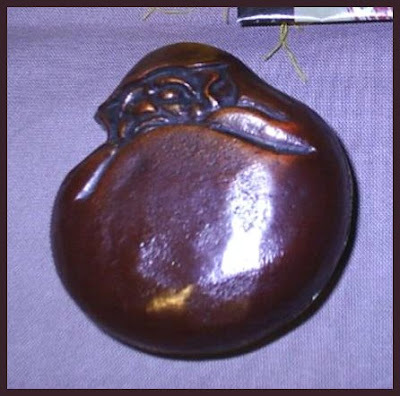 This is a piece of Oribe pottery, about 25 cm high. 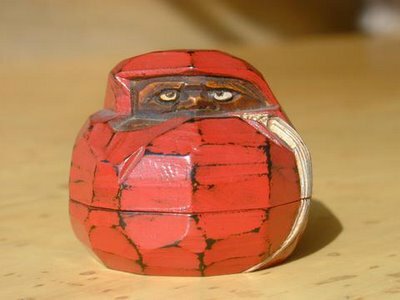 The inside is hollow, so you put this Daruma on an incense cone and the smoke comes out of the ears! The eyes are made with inlay of glass. The beard is modelled with great care and the whole facial expression is one of seriousness mixed with humour. Incense came early to Japan. According to the fifth-century "Nihonshoki" (Chronicles of Japan), a whole aloeswood tree drifted ashore at Awaji. When the fisherfolk burned it, the smoky perfume eventually attracted the attention of Prince Shotoku. From there it was but a step into Buddhism, the sacred purposes of which incense still serves. At the same time, a secular use was also found. The court took up what the church had sanctioned, and shortly incense fumed at hearth and home. 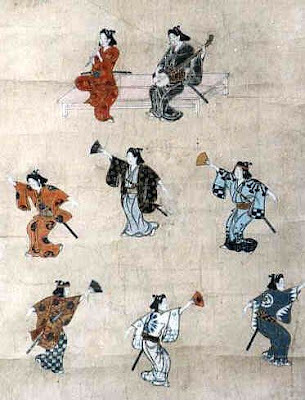 The 11th-century "Tale of Genji" makes frequent references to it. The Shining Prince, Genji himself, encounters it first in a temple, then takes it back and domesticates it. Shortly we find him scenting his robes by holding a small, smoking brazier under each sleeve. 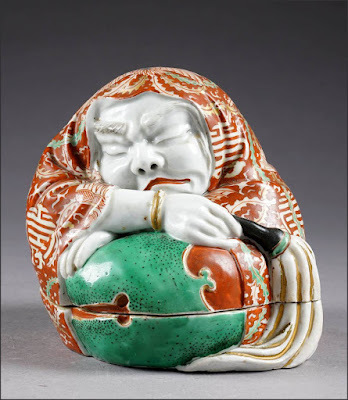 The first imperial poetry collection, the 10th-century "Kokinshu," spoke of "that fragrance more alluring than color" and even the very particular Heian Period author Sei Shonagon included scented robes in her "Pillow Book" listing of things more pleasant than not. Shortly a number of palace activities centered around incense could be observed. Courtiers would bring various samples and make each other guess what they were. This occasioned some difficulty, since by now nearly 2,500 varieties had been recognized. In addition, there were various recondite combinations, and elaborate diversions were invented, such as blending different scents to create the atmosphere of a particular literary work. That involving the "Kokinshu" called for some 700 different types of incense. 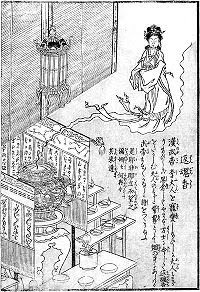 In the "Umegae" chapter of the "Genji," we find the prince hard at work in a deeply curtained room. In the Seidensticker translation, "he turned with great concentration to blending two perfumes according to formulas which . . . had been handed down in secret from the days of the Emperor Nimmyo." Such ceremonial excess is perhaps what eventually did kodo in. 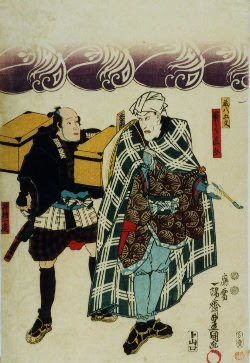 Despite later popularity, in particular during the Genroku Era (1688-1704), and notwithstanding the attentions of such important social figures as Oda Nobunaga, interest in incense-smelling declined to the low level it occupies today. The tea ceremony, however, is still with us, and there are many other examples of such fossilization. One wonders, then, why kodo seems to have more or less vanished. One reason might be that, like many such diversions in this country, it became too openly competitive. Another might be that after its stylishness wore off, it began to look effete to a rising middle class. Yet, as Kiyoko Morita's book indicates, there still remains a public for it. Originally published in 1992, this volume came out in paperback in 1999, and is now available in its first trade paperback edition. Morita gives real assistance. She lists all the popular varieties and indicates where to get them, is knowledgeable about the instruments necessary, gives advice on the "incense ceremony," and tells how to "sample for fun." And, truly, in this age of fast food, of instant replay, of demanding e-mail and the voracious cell phone, something as reflective and as time-consuming as kodo is plainly needed if sanity is to be retained. If it is burned, the soul of a diseased person will come back to life. Or his soul will be seen in the form of the smoke. One emperor in ancient China used this to bring back te memories of his beloved wife Li 李. He used the incinse of a special tree for this occasion, hangonju 反魂樹. This story is also used in Noh-plays, Kabuki and the puppet theater bunraku. 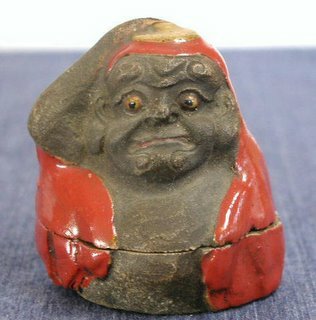 傾城（けいせい）反魂香 Keisei hangonkoo by Chimamatsu Monzaemon. The magic to make this work is called hangonjutsu 反魂術. Maybe as he stands in front of the grave of his parents, lighting a bit of incense, a pheasant's call sounds just like the voice of his parents. Written in December 1689, Genroku 2 元禄2年12月, In Zeze 膳所. For Haikai Kanjin Choo 俳諧勧進牒 compiled by Yasomura Rotsuu 八十村路通 Rotsu. This is not about an incense burner.
. gooshi 合子/ 盒子 set of bowls for food offerings . 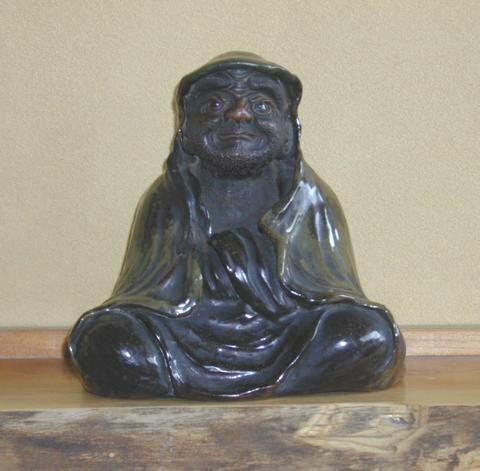 koo o kiku, to "listen to incense" had become fashionable in the Genroku period.